Description of "Do Not take This World Seriously! Vol 2 "
God is not a product of a chemical reaction! In a chemical reaction, you put together certain chemical substances, make them react in a prescribed way, and lo and behold! You will get the products in accordance with the relative chemical equation with 100% certainty. God is not the value of “x” in an algebraic equation so that once you solve the equation correctly, you will know “x”! It is not as if one puts in, say chanting of some god’s name, for a certain number of hours daily, combined with daily visit to a neighbourhood shrine, as also an elaborate daily ritualistic worship of the house deity for a certain number of years and then god has to appear before him! God will COME to you at His own sovereign will. Does it mean one can’t or need not, do anything to meet God? What one DOES cannot be a direct cause for taking him to god. What is fundamental is the desire to meet god. It also means that one has to turn away from the world (detachment - vairaagya bhaav), if s/he desires to meet god. The reason is one can’t keep holding onto the river bank and hope to swim across to the far bank! Jesus Christ also said, “No one can serve two masters. You cannot serve both god and money.” (Matthew 6:24). Thus, it seems clear that what one does is less important than what one stops doing since most of what one is doing is related to the worldly life. However, what one does in the spiritual realm, for example meditation, keeping company of like minded seekers, reading of holy literature, worship of a deity, chanting god’s name etc, can help in getting one’s mind to develop, and keep burning, an intense desire to meet god. It will also help keep one’s mind away from the worldly matters and focus on the spiritual. Then one has to simply wait for god to come to him in His good time. Vairaagya (disinterest in worldly life) is a crucial prerequisite for moksha (liberation / salvation). However, this disinterest should be a mental phenomenon. What one is doing outwardly is immaterial. One may appear to be leading a normal life. But inwardly, he is detached from whatever may be happening around. Spiritual pursuit is a journey consisting of many steps. So, a gradual progression towards stronger and stronger vairaagya can be expected and not quite an overnight change. So, even that gradual change along the way is also a spiritual pursuit. However, moksha or liberation cannot come about until a thorough and durable vairaagya bhaav (detached attitude) is established firmly in one's mind. Moksha/Mukti (Salvation / liberation) is a liberation that can be experienced in this life when we are still in this body on this planet. It is basically liberation from the duality of pleasures and pains as normally experienced by us. For attaining this kind of salvation, one has to first get a strong a durable desire to attain it. One has to get disillusioned with the ups and downs and the constant agitation of mind that this life essentially is. Then by following a path of spiritual practice as prescribed by the scriptures and spiritual masters of the past, preferably under the grace of a living master, one will be able to transcend his identification with this limited body and ego. That is when the duality of pleasures and pains will disappear since it is associated with this limited identification. That ultimate spiritual experience of liberation can be experienced in this life, very much in this body and with this very mind. The author was born and brought up in a fairly conservative brahmin family in a small town, living a typical god fearing life till his early youth. Later, he moved to the metropolitan city of Mumbai (India) to do his graduation in technology from Indian Institute of Technology, Bombay, a premier technology institute in India. Through his career, he lived in many different places interacting with many different people of widely varying thinking. As such, by virtue of his education and profession, he must have changed significantly from a god fearing child and teenager to a “rational intellectual adult”, such as they come in the modern times! So, he never thought he would ever become a serious spiritual seeker. In the year 2000, he stayed with his younger brother in Singapore for about 3 months, when he was on a short project assignment and his brother was a permanent resident of Singapore. The brother had already got onto the spiritual path and had received “deeksha” (initiation into spiritual pursuit by a self-realised guru) from a living guru. During a conversation, the author once said to his brother that being an intellectual, he didn’t think he would ever “surrender” to a guru to get into a serious spiritual pursuit! But The Divine willed otherwise! Within a few days of this conversation, the author had an encounter with his brother’s guru and it transformed him into a different person. He took up spiritual pursuit in earnest interest and got formally initiated by his sadguru. The author believes that his encounter with his brother’s guru in Singapore as described above was the divine nudge to him to get on to the spiritual path. The author says he is just an ordinary seeker. However, he was blessed by the Almighty with a sustained desire to study Shrimad Bhagawad Geeta which is the best spiritual philosophy in the Indian tradition. He read and reread the commentary non pareil on it, called Shri Jnaneshwari or Bhaavaarth Deepika by one of the greatest Indian saints, Sant Shri Jnaneshwar Maharaj. The author’s understanding of spirituality comes totally from his reading of Shri Jnaneshwari and the related literature / discourses by his guru lineage. He had been regularly posting his spiritual musings as blogs on the Speaking Tree website of Times Group of India. Also, more than 20 spiritual articles of his have been published by one of the leading daily newspapers of India, The Times of India, in its column on spirituality titled Speaking Tree. 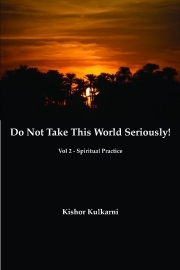 Reviews of "Do Not take This World Seriously! Vol 2 "